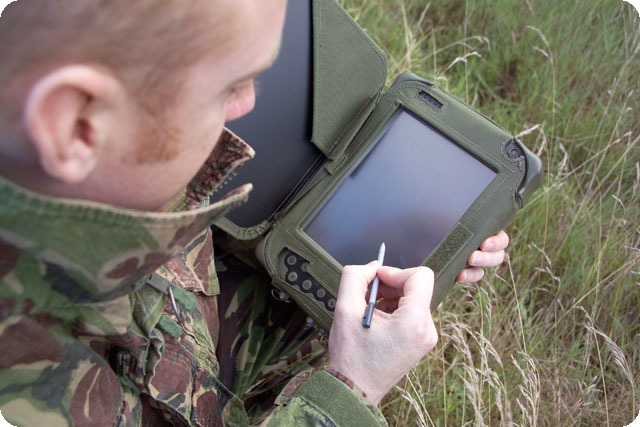 A resistive touch screen that features durability to match the most demanding applications such as military, marine, avionics and industrial displays where the tough finish and wide temperature stability are required. 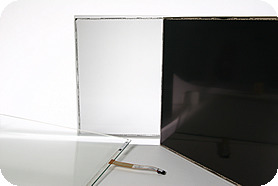 The hard glass front surface provides the scratch resistance and ruggedisation typically associated with glass touch technologies such as capacitive or surface wave acoustic, but has the flexibility of use just like a standard resistive due to the flexible borosilicate glass surface. Assembled individually in class 100 clean room conditions, the touch screen display is bonded to filter materials, glass and plastics in a sandwich construction of index matched dry film adhesive. Full optical lamination improves the impact resistance of the touch screen monitor and keeps an industrial touch monitor screen intact when broken, thus protecting the equipment and the safety of the user. Standard ruggedisation is the US military boot and wrench test and BS 6206: 1981 Class B and has the ability to withstand heavy repeated blows from objects such as bricks, hammers and crowbars. Impact performance of industrial touch screen displays can be further enhanced to Class A and above by using extra lamination layers and chemically toughened glass. Ultimate strength in the final touch sensitive monitor is limited by the type and thickness of the touch screen along with its integration. The laminations are tested for impact resistance, surface damage and penetration in accordance with ISO 6272 using a Falling Block Impact Tester 806/40. BS 6206 (UK standard): Class A impact resistance is achieved on the other touch screen lamination due to the extra filter material layers. Even when broken, the lamination layers maintain the integrity of the touch screens, protects the display from damage and prevents the risk of glass splinters. Maximum contrast enhancement and "sunlight readability" is achieved by incorporating a neutral density circular polariser. 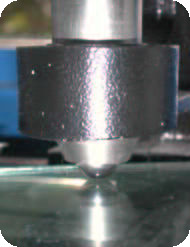 Circular polarisers are well established as the most efficient form of contrast enhancement available with a 40:1 C.E. ratio. The washed out appearance of the display caused by ambient light reflected from the display is modified by the circular polariser as it passes through and traps the mirror image on reflection from the surface of the touch screen. The signal from the display is allowed to pass through the filter and appears as a bright image against a dark background. Circular polarisation is the ideal solution to improve the sunlight readability or resistive touch screens. 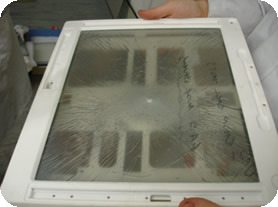 A louvre privacy film (light control film LCF) can be easily incorporated into a touch screen lamination to form a computer privacy screen. Standing in front of the screen allows you to see the display through the individual louvres, if you were to view at an angle of 30' or great from the centre line, the image on the screen would be blocked by the sides of the louvres. A simple analogy for the privacy film is a Venetian blind. Typical applications for privacy displays are ATMs and public kiosks. A 17" diagonal screen is the maximum size available. The technique is suitable for indoor or outdoor privacy screens. It's now possible to supply privacy filters in screens larger than 17" with the option of vertical louvres (up and down blocking of the image) as well as the horizontal (privacy filters left and right). To defrost and /or maintain an optimum screen temperature, a transparent heating element can be bonded to the rear surface of the touch screen. Maximum available size is a 400 x 500mm. Click here for more information. Direct sunlight heating can be controlled by the addition of a Near-Infrared filter, while still providing a high level of visible light transmission (>70%) the NIR filter blocks 90% of Infrared at 850nm increasing to 95% from 950nm. EmiClare is an EMI shielding mesh designed for optimum optical performance with a high level of shielding effectiveness at both high and low shielding frequencies. Military, test equipment and medical markets are typical applications requiring extra EMI shielding provided by incorporating EmiClare mesh into a touch screen monitor lamination. Our UK customisation of touch screen technology can be incorporated into computer privacy screens, LCD touch screens, laminated glass and 3M PSA laminates and one touch monitors.